They are blooming like multicolored moss on the walls of buildings throughout urban areas. Outdoor murals, painted in a medley of styles and designs, are popping up in places as diverse as New York, Miami, Indianapolis and even Greensboro, North Carolina. 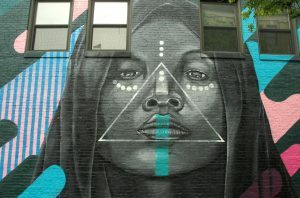 Large-scale street art has become the darling of many community development agencies which see this as a way to enhance blighted areas and build neighborhood pride. Increasingly, however, private developers are adding outdoor art to attract residents and business tenants, enhance buildings, entice tourists and ultimately improve property values. 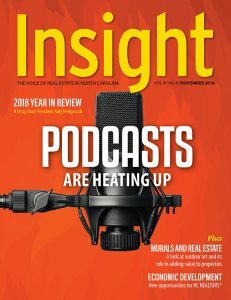 W. Marshall “Marty” Kotis, CEO and owner of the Greensboro-based Kotis Holdings, has a passion for outdoor murals which reflects both his personal love of art and business acumen. He has commissioned more than 40 murals for his properties in the last three years. “It ups the cool factor of the area,” he said. When asked if the artwork has increased the properties’ revenue streams, Kotis said, “We saw a definite difference in a couple of years.” Street murals are “open to the public; people can see it 24 hours a day, seven days a week. They can enjoy the art on their own terms. It’s more welcoming; it’s much more accessible.” Visitors often post photos of the art on Instagram and Flickr, sparking free publicity. Outdoor art helps brick-and-mortar retail business compete with online shopping. Stores must create “an experience,” Kotis said, to lure customers away from their screens. Outside art establishes a shopping destination, a place where people want to spend their day, he said. The current trend toward wall art evolved from the often-despised graffiti and street art that began popping up in American subways in the 1970s, according to Widewalls, an art website. Graffiti was once seen as a blight that lowered property values. Over time, many graffiti artists, such as Keith Haring, emerged as gallery-worthy designers. Developers took note. A pioneer in the move to add outdoor art was Goldman Properties. Tony Goldman transformed Soho in New York City and Miami’s Wynwood and South Beach sections into upscale properties, in part because of large-scale outdoor art projects. Art has paid off. A 2016 study in the United Kingdom compared geotagged photos of art on Flickr with property values and found a distinct correlation between street art and increased property values. 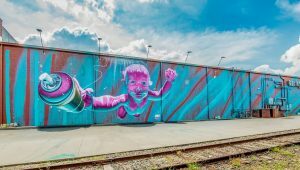 “Neighborhoods which have a higher proportion of ‘art’ photographs also have greater relative gains in property prices,” researchers concluded. According to Realtor.com, art projects in Chicago’s Millennium Park fueled real estate growth to the tune of $1.4 billion. Even in smaller, suburban communities, public art is seen as a key factor in improving the urban environment. In Malden, Massachusetts, a commuter city outside Boston, Malden Arts has launched the ARTLine initiative to create outdoor galleries. The initiative emerged after Malden Arts created a mural this past spring in a small neglected park, using motifs from famed children’s illustrator and Malden native Ed Emberly. Previously, the park was “totally unnoticed and had an ugly wall on a parking garage,” said Naomi Kahn, Malden Arts treasurer. “We finished (the mural), I went for pizza, I came back, and I found people already were drawn to the park.” Now Malden sees art as a way to improve its cityscape. Many low-income urban areas struggling to attract development have turned to murals. The blighted city of Lynn, Massachusetts, is still best known for the decades-old rhyme: “Lynn, Lynn, city of sin, you never come out the way you go in.” Now, Lynn has another reputation—as the location of the “Behind Walls Mural Festival” which attracts flocks of visitors downtown to view the more than 40 murals. Beyond Walls, a nonprofit focused on revitalizing downtown Lynn, sponsors the event. The group raises money, gets commitments from property owners about using their walls and recruits well-known muralists. The work reflects a graffiti influence; some are luscious portraits of women and men; some resemble cartoons; and some are as elaborate as a Diego Rivera painting. News organizations delight in picking out favorites. Developers must consider key points before leaping on the mural bandwagon. One is potential controversy. “Art by its very nature is meant to be a discussion,” Kotis noted. Many street murals are political statements or deliberately provoke a reaction. He suggests developers thoroughly research an artist before a making commission or hire a professional curator. That doesn’t have to happen. “The art is beautiful but the rent goes super high and the families for whom the art was [made] for, get displaced. Here, that’s not the case,” said David Valecillos, director of the museum program for the North Shore Community Development Coalition, which has created the Punto Urban Arts Museum in a struggling area of Salem, Massachusetts. For decades, tourists flocked to Salem, known as the “Witch City,” but seldom ventured into the Point neighborhood just a few blocks away. “An invisible barrier” kept tourists from the largely Hispanic, lower-income area, Valecillos said. The coalition began adding murals to their low-income housing property by local and national artists in 2016. The barrier melted away. Tourists began to venture in—and spend money. Destination Salem, a publication with a 350,000 circulation that promotes Salem, has highlighted the Punto Urban Arts Museum as one of the top things to do, Valecillos said.